Drain canned peaches and pears, reserving juice for Step 2. Add water to juice to equal liquid required for gelatin and bring to a boil. Pour hot liquid over gelatin. Stir until dissolved. Add cold water to hot liquid. Spoon ½ cup of fruit in to individual serving cups. Pour gelatin over fruit. Chill. Cover and place in refrigerator to congeal. Portion ½ cup fruit with gelatin per serving. Each serving provides ½ cup fruit. Any flavor of gelatin may be used. Alternative preparation idea: Fruit may also be poured into a full sized sheet pan and gelatin mixture pooured over the fruit. Place the sheet pan in refrigerator to congeal. Cut fruited gelatin __ x __. Serve 1 square of fruited gelatine per serving. Each serving provides ½ cup fruit. 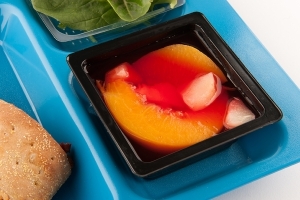 "Culinary Techniques for Healthy School Meals: Preparing Fruits" provides preparation and serving ideas for fruits. 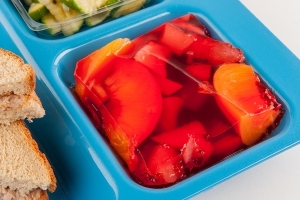 1 serving of Fruited Gelatin prepared in a sheet pan.